Things to happily check off my list: Watch It's a Wonderful Life. Check. 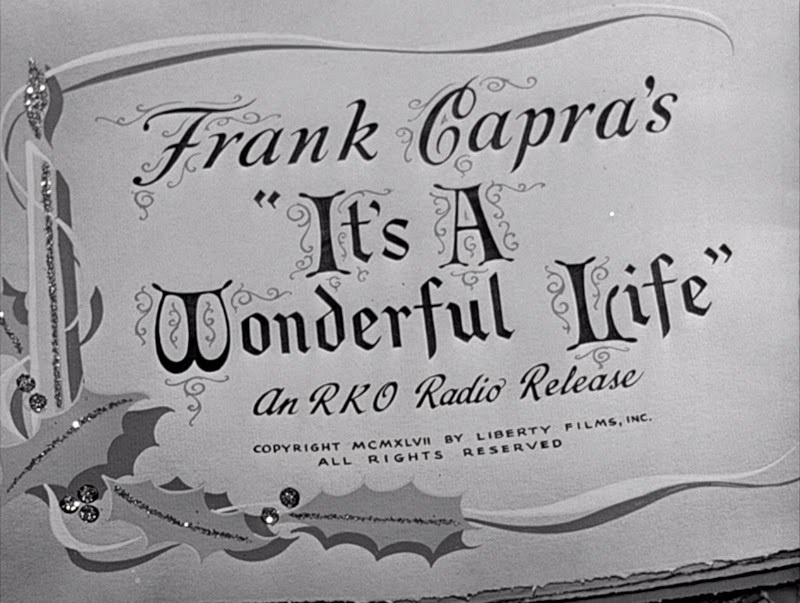 Watch a Frank Capra movie. Check. I am patting myself on the back for putting this up first on my 2015 Blind Spot list, a genius idea for a blog feature created by Ryan McNeil at The Matinee. I loved every minute of it. I was a stubborn young man. My Mom constantly tried to get me to watch "old" movies. I always acted like a little punk about it. I don't know why. I wish my Mom had kept trying when I really started loving movies, began actively watching anything I possibly could at around the age of 17. You hear some people scoff at the idea of watching a black-and-white film. I read that, this one, after making it's way into public domain territory was "colorized." How sad. This is a beautiful film, a portrait of a lovely small town, shot in glorious black and white. I'm glad I'm seeing it now. And this way. For some reason, It's a Wonderful Life eluded me...until now. My Dad recently asked me if I'd ever seen this movie. He couldn't believe I hadn't. It made this choice even sweeter that I got a random recommendation after I'd already made this my first Blind Spot. How happy I am to have seen it. There are two kinds of people in any small town: the ones who get out, and the ones who don't. Where does George Bailey land? What does he want? What does he get? These are the questions raised and answered by Frank Capra's It's a Wonderful Life. 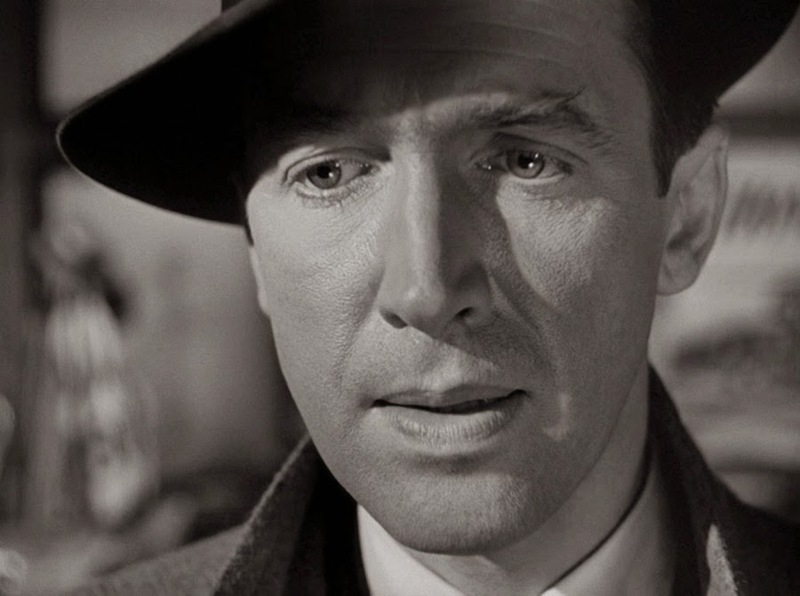 You see, George Bailey (James Stewart) is so intertwined with his hometown of Bedford Falls that he, at times, seems to forget what it means to him, what he's done for it, what it's done for him. The elder son of a ne'er-do-well Building and Loan man, George grows up with one dream: see the world. In the midst of all his dreaming, there are people in a town who need him. This internal conflict drives the movie. He is a loving and compassionate man, but he doesn't always see that in himself. He doesn't believe that's him. His actions come from the heart, his dreams come from his head. This is a film where heart wins. The structure of the movie is simple, yet magical. It opens on Christmas Eve with people praying, wishing, hoping for good to come to George. He is down and out, and we don't yet know why. Up among the stars, God hears their prayers and enlists an Angel called Clarence to make his way to Bedford Falls, the one task that will earn him his wings. But first, his story must be told. George was always a selfless character. A man who saves his little brother from drowning as a boy, who captures the heart of the pretty girl next door in Mary (Donna Reed), who stays on to run the family business with his Uncle Billy (the great Thomas Mitchell) after his father's death, leaving his college and world traveling behind, who gives his own wedding purse to his clients as they rush to withdraw their investments, who turns down the huge job from the town kingpin, Mr. Potter (Lionel Barrymore), because he knows how and what that may destroy, he gives and never takes. He is loved. But he still wants more. No actor could better portray this character. 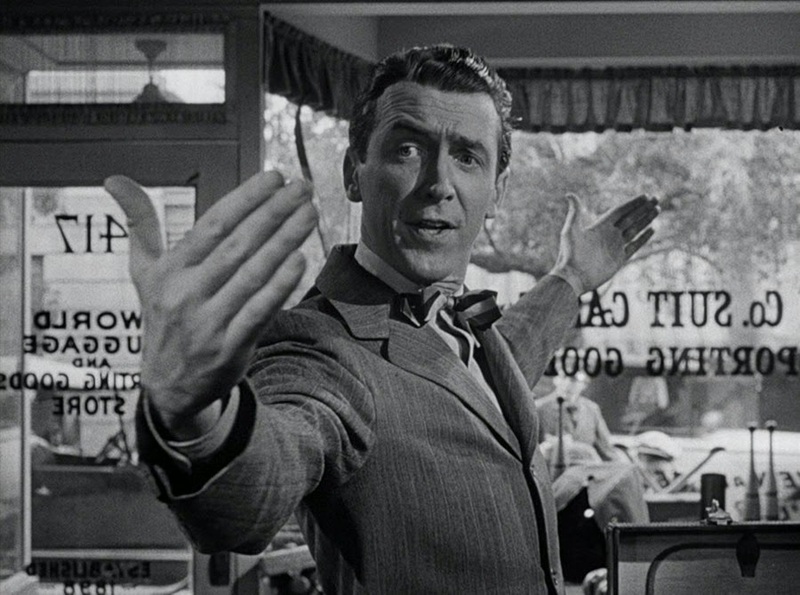 Jimmy Stewart is one of the most real and likable actors to ever grace the screen. He is iconic in his accent and mannerisms. He plays the internal struggle of George Bailey to a perfection rarely seen. You can actually see a sadness in his distressed face when he makes all the right choices, does good, just plain good, all the while wishing for another life. A life of his imaginings. It's life that happens to us while we're busy making other plans, yes? Nothing is more certain for George Bailey. Nothing. From what I understand, Frank Capra often crafted parables of good people. Nice people. People of values and faith. This is the ultimate story of a life. A good life lived by a good man, who never realized his own value until it was almost too late. This is a perfectly-crafted, beautifully shot film. The kind of movie you know was made with great love and care. 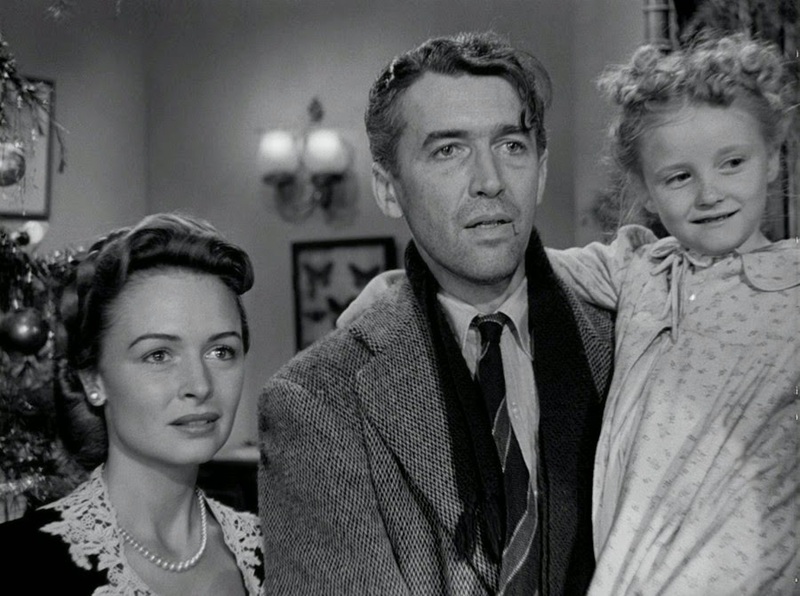 The last act of It's a Wonderful Life is one of the most charmed and charming experiences I've had with a movie. Clarence, the Angel, enters and shows George, in A Christmas Carol-style, what his life would be without him. It's not a pretty thing. As Clarence muses, "Strange, isn't it? Each man's life touches so many other lives. When he isn't around he leaves an awful hole, doesn't he?" This movie works and is so immensely memorable and successful because it is about all of us. We all have dreams that never come true. We all want things we, deep down, know we can't have. We all touch the lives around us in ways we can't possibly comprehend. I was reminded, as I watched this movie, of Pete Docter's Up!, animated by Pixar and released in 2009. It was then I realized how timeless It's a Wonderful Life is. It's not inspiring (although it certainly has inspired other stories of this kind), it's inspired. Like Up!, it is inspired by the good there is in life. By love and happiness and hopes and dreams and fears. George Bailey was a man afraid of failure but so far from being that. 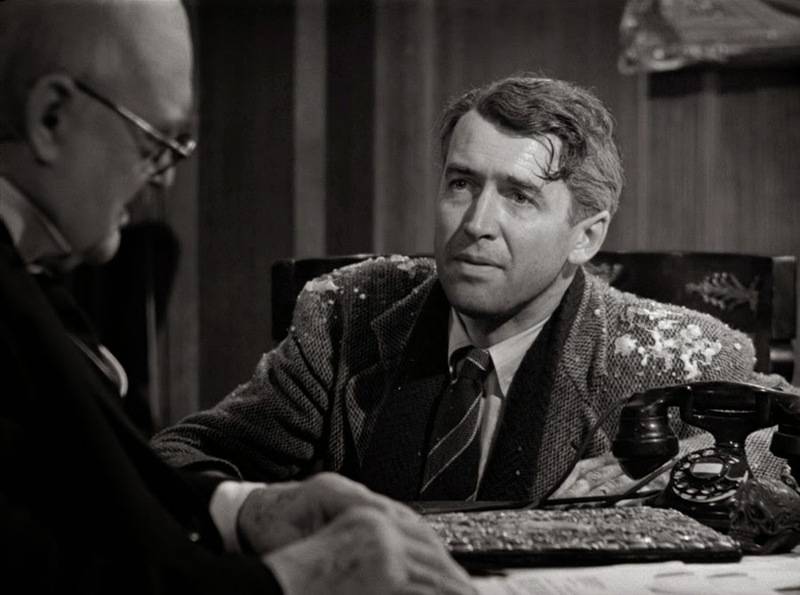 He just needed a slap in the face on the happiest day of the year to make him realize that his life in Bedford Falls has been full of wonder, the same kind he never knew he wanted. George's life was full. Filled with a beautiful, loving wife for whom he lassoed the moon. Filled with beautiful children for whom he did as well. Filled with a family who ran a business for the good of a town and its people, not money. Filled with friends. Yes. Friends. A whole town of them. People willing to pay it back and forward for a good man, the best kind of man, on Christmas. I live in a small town myself. The same town I grew up in. I've almost never wanted to leave. I am a small town guy with few regrets. Lucky for me, I differ from George Bailey in that way. Or maybe I just realized my place in this life a bit quicker. Maybe I don't even know, yet. I do know, though, that small towns, the towns of our youth, are special. And I also know and "remember" that "no man is a failure who has friends." George is most certainly an "Everyman." Like you say, that's a huge part of this movie's appeal. We can see ourselves in him. It's also one of the most delightfully cheesy movies of all time. It just reeks of the warm & fuzzies. Great review. My only complaint is that you didn't save this one for Christmas time, lol. Haha! Thanks man. It is cheesy, but I like that. I love that actually. Nothing like well-crafted cheese. I wanted to see this one so badly I just couldn't wait until NEXT December; therefore, I chose January. I love this movie so much, and your review reminded me of that! I still remember the first time I saw it...and how touching it was. Stewart delivers one of his finest performances ever here! It's just so nice. I love movies about nice people. They're so rare. What a great post! I love this movie, even though my family and I laugh at the dated, very cliched portrait of gender roles every time we watch it. :-) (You're not going to like it George ... she's an *old maid! *) It is so unabashedly sentimental and hopeful. I never get tired of this movie. By the way, I love the title of your blog. My husband, older daughter, and I go around spewing movie quotes in every conceivable situation. We are such nerds. Thanks so much. It is sort of dated, but, hey, it was the '40s, right? Haha! It's such a sweet movie. I too share the constant quoting of movies affliction. Some of my closest friends and I seem to always be able to fit one in somewhere. Our wives and girlfriends make fun of us. Nerds forever. Lovely, lovely writing... but I have always hated It's A Wonderful Life. Maybe I'm too cynical, but it just reeks of sentimentalism from the first frame, and while there are nice moments, on the whole I just don't respond all that well to it. Ah well - I suppose everyone has at least one incredibly popular, well-regarded film that they just don't like. Come on, Dan. Let the sentiments run through you. Haha! Seriously, though, as far as incredibly popular movies I don't like, there is definitely more than one. There are lots of sentimental movies that I really like! Just something about this one that has always rubbed me the wrong way. I wish I could articulate it better. Probably something having to do with George always wanting to get out and see the world and he doesn't get to (I liked the town where I grew up but always wanted to get out just the same). Yeah. It was about time. I loved it. I plan to watch bring it back into yearly tradition. Great review! This is a film I've been meaning to watch for years, but I still haven't got round to it yet. This will be the year! Do it, Allie! It is one I am ashamed I waited so long for. Should've seen this way before my 30th year. Thanks for stopping by.